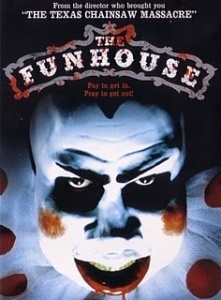 The circus is in town, and Amy (Elizabeth Berridge, who replaced Meg Tilly in Milos Forman's AMADEUS), her friend Liz (Largo Woodruff, STARDUST MEMORIES) and their respective dates, geeky Richie (Miles Chapin, HAIR) and hunky Buzz (Cooper Huckabee, THE CURSE) have decided to sneak in and stay after hours. 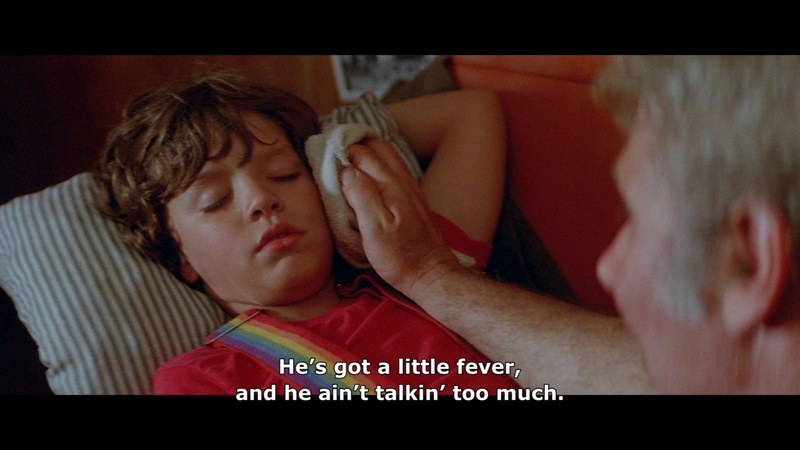 Amy's bratty brother Joey (Shawn Carson, SOMETHING WICKED THIS WAY COMES) has also snuck along. 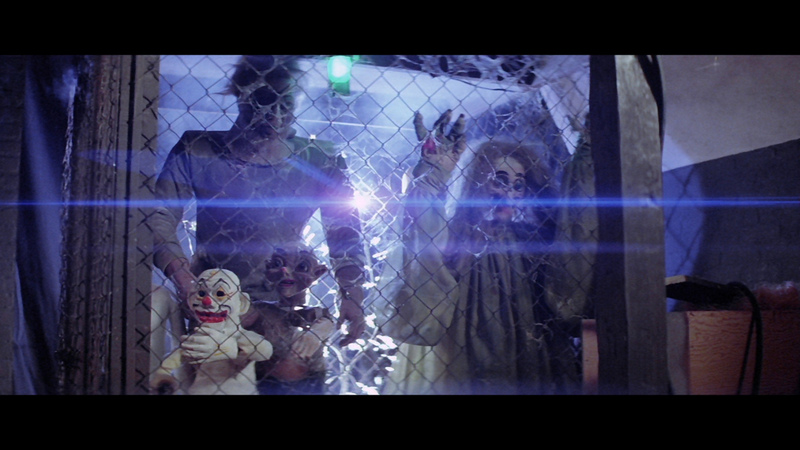 When the teens witness the accidental murder of Madame Zena (Sylvia Miles, THE SENTINEL) by the carnival's authentic freak - sired by the carnival's sinister barker (Kevin Conway, JENNIFER EIGHT) and... something - they find themselves trapped in the funhouse and stalked by the freak. 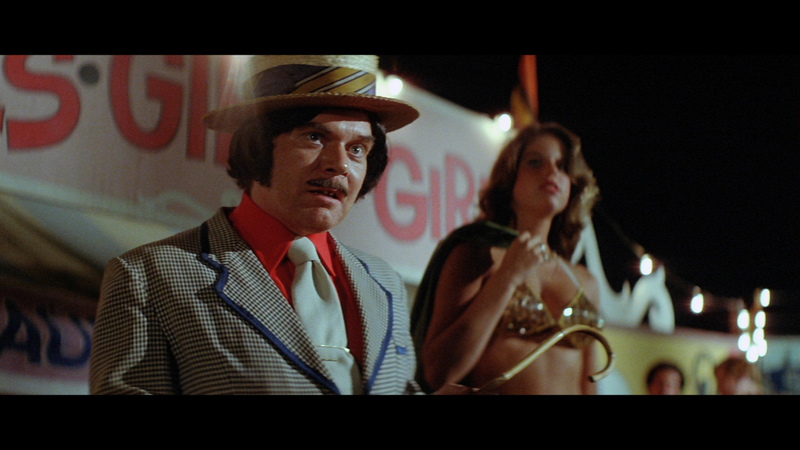 William Finley (of Hooper's EATEN ALIVE) also appears. 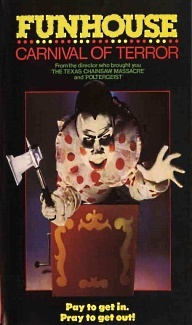 Very, very, loosely adapted from the paperback of the same name by Dean Koontz (the script discards the first 3/4 of the book including back-story about the siblings' connection to the carnival, and pretty much focuses on the stalk and slash final section), THE FUNHOUSE is one of a handful of memorable eighties healthily-budgeted Universal horror offerings resulting from the profitable upswing in horror following the independent success of HALLOWEEN and Paramount pick-up FRIDAY THE 13TH (Universal's outings also included two Dino De Laurentis-produced HALLOWEEN sequels, Paul Schrader's CAT PEOPLE, John Carpenter's THE THING, as well as some lower-budgeted Carpenter and Wes Craven pics later in the decade). 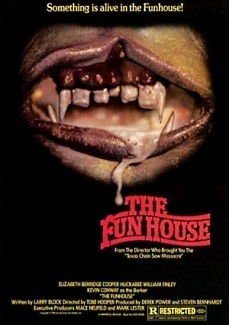 Aside from Rick Baker's and Craig Reardon's impressive freak make-up, the plot is pretty ordinary for the genre, but it is executed beautifully by director Tobe Hooper (THE TEXAS CHAIN SAW MASSACRE) with shadowy and gel-lit photography by Andrew Lazlo (STREETS OF FIRE), the creepy music of John Beal (who provided a fully original score for Universal's horror movie documentary TERROR IN THE AISLES), the disorienting funhouse sets of Mort Rabinowitz (who also served as production designer on Hooper's TV miniseries of Stephen King's SALEM'S LOT), and a excellent performances by the quartet of likable teens-in-peril (including final girl Berridge, who gets to show off her scream queen chops early on with a shower scene disrupted by a knife-wielding assailant), as well as the performances of Conroy and Miles. • Collector’s booklet featuring brand new writing on the film by critic and author Kim Newman. 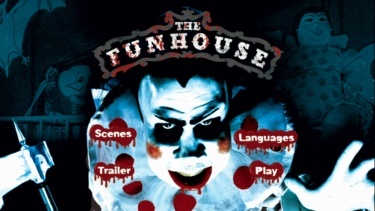 NOTE: Arrow's repressing of The Funhouse will be region 'B'-locked! ADDITION: Shout! 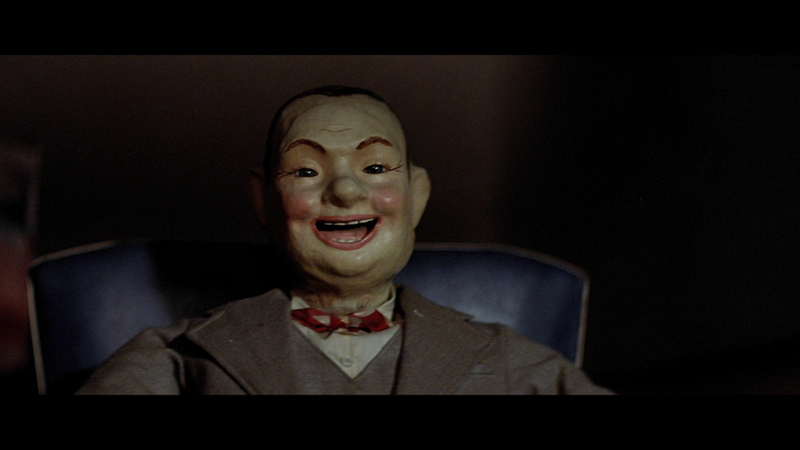 Factory - Region 'A' - Blu-ray - October 12': Although I may have missed the exact frame on a couple of these screen grabs comparisons - the technicals tell us that this is extremely close in terms of video quality between the two Blu-ray releases. 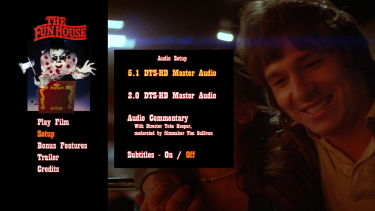 The Shout Factory transfer does offer a lossless 5.1 surround mix - that has a few brisk separations. It also has optional English subtitles. When it comes to extras though the region FREE Arrow is stacked and remains far ahead. 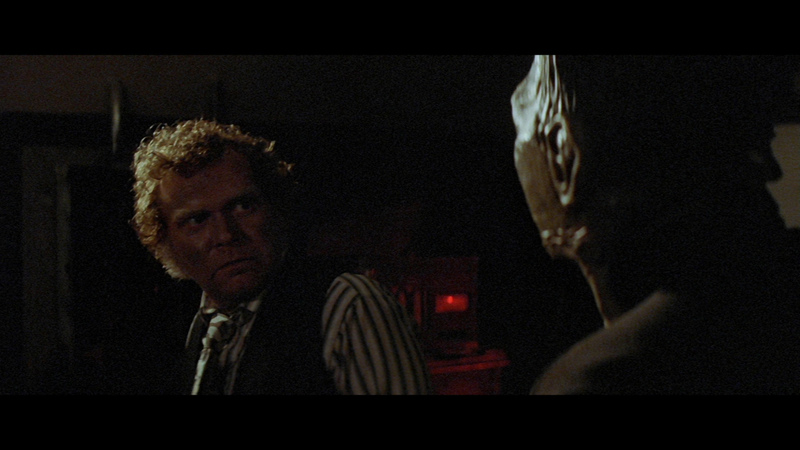 If you are keen on the hefty Arrow supplements that seems the disc to buy but if your extras requirements at the more modest end (although it offers the Tobe Hooper commentary and 1/2 hour of video extras plus deleted scenes) then the Shout! Factory won't disappoint with its 1080P presentation. ADDITION: Arrow - Region FREE - Blu-ray - October 11': So is it that the DVD is vertically stretched? or is the Blu-ray horizontally stretched? or is it a little of both? You can judge yourself by the screen captures below but while I think it may be 'both' - I also think the DVD is more stretched disproportionately than the 1080P. The thing is that without the side-by-side comparison neither might seem as 'flawed' as they are presented below. 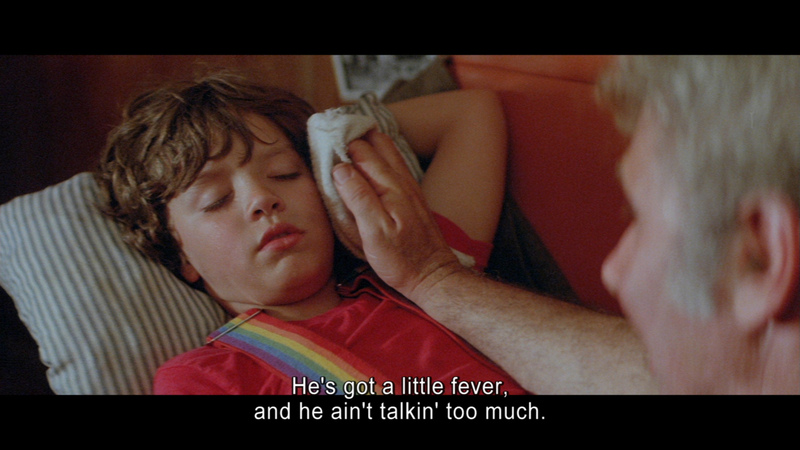 Beyond that what we have is a typical example of the less-effectual early 80's film stock that never translated smoothly to digital. 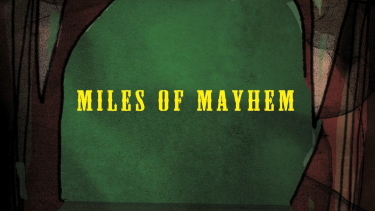 The Blu-ray is cropped on both side edges but because of the, presumed mutual, stretching - both are still 2.35:1. It's both unusual and revealing. I only own the Blu-ray and thought my viewing presentation was 'okay'. I accepted that it was not at the stellar levels of depth and detail that we have seen from the format but I don't blame the 1080P transfer - as I felt that as a reflection of the original, modest, appearance it is probably not too far off. 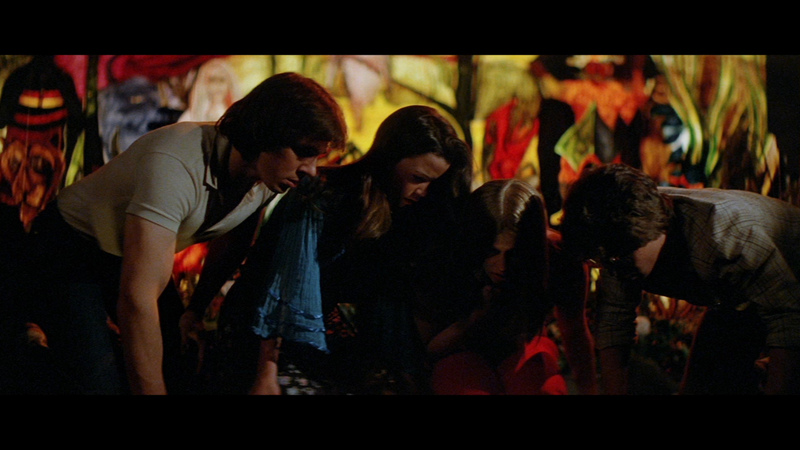 The Blu-ray is consistent with a bit of grain, predictable noise and almost no damage. 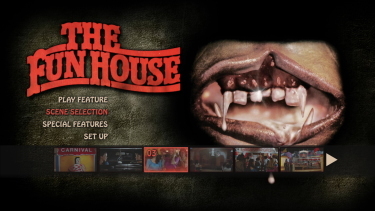 I suspect you aren't going to see Tobe Hooper's The Funhouse in a much more authentic appearance than Arrow film's dual-layered Blu-ray with a high bitrate. Arrow supply a 2.0 channel stereo DTS audio track 1509 kbps as well as optional English subtitles on the region FREE Blu-ray disc. The UK package has extensive extras that give it the strongest proportion of value with 3 separate commentaries . The first with The Funhouse S/FX wizard Craig Reardon and Jeffrey Reddick (creator of The Final Destination series), a second from producer Derek Power and genre scholar Howard S. Berger and a third with Justin Kerswell, author of ‘Teenage Wasteland’ and host of the slasher cinema website Hysteria Lives, and author Calum Waddell (Taboo Breakers: 18 Independent Films That Courted Controversy and Created a Legend). 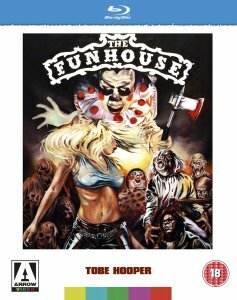 There are 5 video featurettes (about 1.5 hour's worth); the 16-minute Carnage at the Carnival where Tobe Hooper recalls ‘The Funhouse’ , the 21-minute Miles of Mayhem about acting in Tobe’s Funhouse with star Miles Chapin, an 18-minute piece A Trilogy of Terror: The Make-up Madness of Craig Reardon where the S/FX wizard recollects his collaborations with Tobe Hooper; ‘Eaten Alive’, ‘Poltergeist’ and ‘The Funhouse’. 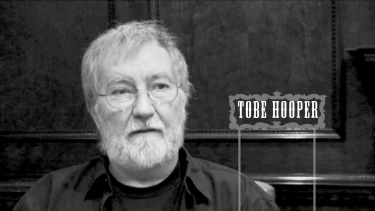 There is also a Master Class of Horror where Mick Garris, the director of Sleepwalkers and The Shining (TV mini-series) reflects on the crimson-covered career of his longtime colleague Tobe Hooper for more than a dozen minutes and lastly a Live Q&A, of very poor video quality, with Tobe Hooper from San Francisco lasting just over 20-minutes. There is a gallery with some 'Never before seen' behind the scenes photographs from the collection of Craig Reardon and a trailer. The package itself has a 4 panel reversible sleeve options with original and newly commissioned artwork, a double-sided fold-out artwork poster and a collector’s booklet featuring brand new writing on the film by critic and author Kim Newman. So the Arrow Blu-ray is TOTALLY stacked and I feel the presentation is offered in a competent and fairly accurate, if not stellar, representation of the original. This is easily the product to own if you are keen on the director or film. 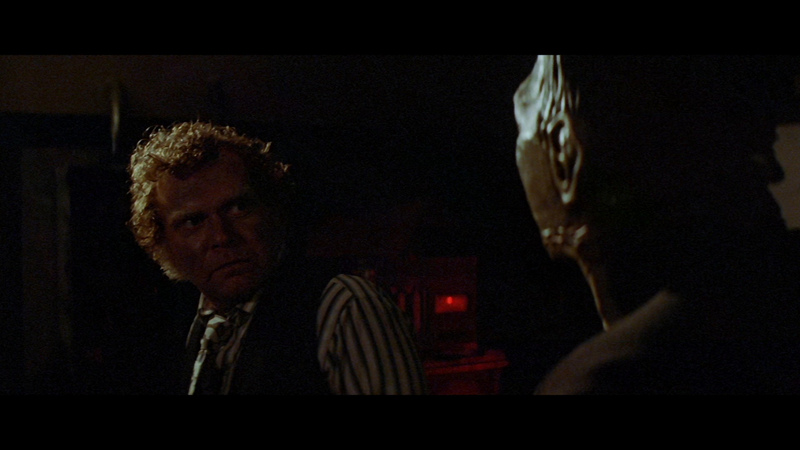 It's hard to deny all the effort Arrow has put into this Blu-ray - it is, at its least, VERY impressive. 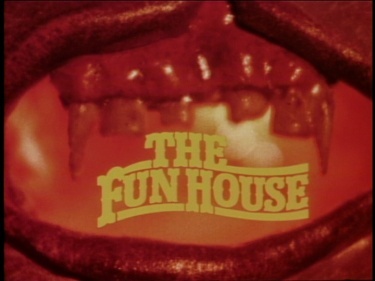 ON THE DVD: Through an arrangement with Universal (who had sub-licensed most of their eighties horror titles to Image Entertainment), Goodtimes Home Video released THE FUNHOUSE on DVD in 1999 in a good, though non-anamorphic single-layer and production notes. 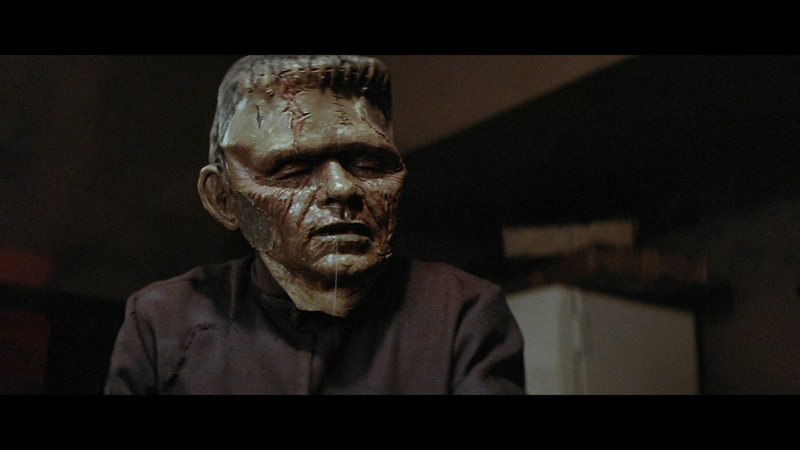 In 2004, Universal reissued the film in a new anamorphic, single-layer, progressive transfer. A dual-layer encoding might have better served the strong colors and contrasty lighting. 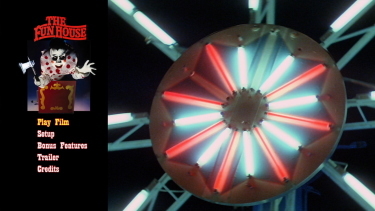 The 2.0 surround encoding is vivid throughout thanks to a detailed Dolby Stereo mix full of death rattles, diverting funhouse sound effects, monster cries, and John Beal's superb score. 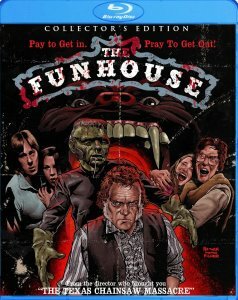 The Universal transfer is also available in this 4-film set (HERE) with SSSSSSS, PHANTASM II, and SERPENT AND THE RAINBOW.